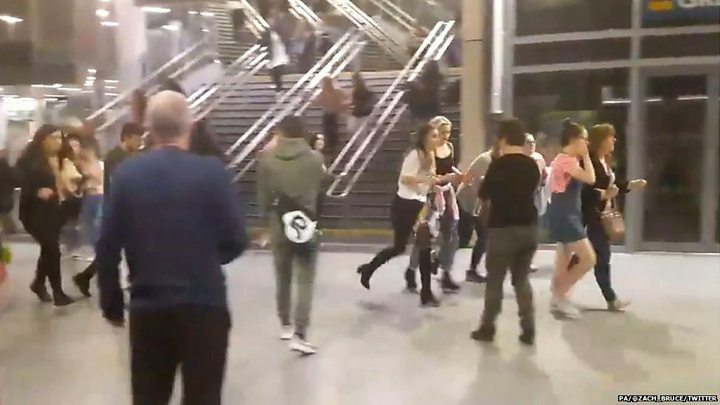 Witnesses have described the chaos and horror after a fatal explosion at the concert by US pop star Ariana Grande at Manchester Arena. Nick Haywood, 46, from Nottingham was waiting for his 16-year-old daughter Caitlin and her friend, also 16, when the explosion happened. He said: "You could feel it, you could feel the noise. It was incredibly loud. My first thought was to find my daughter. "People were already starting to filter out. You could tell something was wrong, no-one was laughing or chatting. Some people were running, a bit of mild panic. "I was trying to get hold of them on the phone but the network was down so I made my way into the arena. Seeing her on the stairs was a huge relief. "It was like she was almost born again. It was the best moment of my life all over again." Caitlin had planned and saved up for the trip for months. She said: "We were so excited when the day came and we were listening to her music on the train. We were so excited, but it turned out to be be a bad experience. "When people said [the noise] was a balloon or a speaker, in the back of my head I knew it was a bomb and we needed to get out. "I thought the next minute people with guns were going to start coming in." She said she and her friend were near the front of the stage when the blast took place and she said people were getting crushed as they panicked and ran for the exit. "As soon as Ariana Grande left [the stage] the lights went out and the bomb went off. That made me think that this person planned it so well." Stephanie Hill and her daughter Kennedy were at the concert. She said the police and emergency services entered the building soon after the blast, but she still didn't feel safe. "The police were all there, there were armed police with... their guns, there were ambulances. "They were there so quickly it was unbelievable. But we didn't know, even then we didn't know what was going on. "We were thinking 'oh my God, we're going to get shot'. "So we ran, we ran and we hid under a bridge for about forty minutes." Kennedy said at first the arena was "scarily still for five or six seconds... then everybody just ran." Leah Cassidy, 16, from Radcliffe was at the concert with her friend. "As the concert finished and we were nearing the tunnel to leave the auditorium, there was a huge bang that shook the whole ground. The whole auditorium went deadly quiet for five seconds and then the screaming began. "The bomb went off near our tunnel. Because everyone started pushing back from the tunnel we were going to, my friend and I held hands and started to run to the opposite direction. "As we were running, I saw smoke everywhere and shoes on the ground from people trying to flee. It was frantic. "Then we got outside we saw a little girl and boy aged about eight or nine distraught as they couldn't find their dad. We stayed with them until he found us. "I'll never forget the horrific feeling. It was a sad way to end the best night of my life." 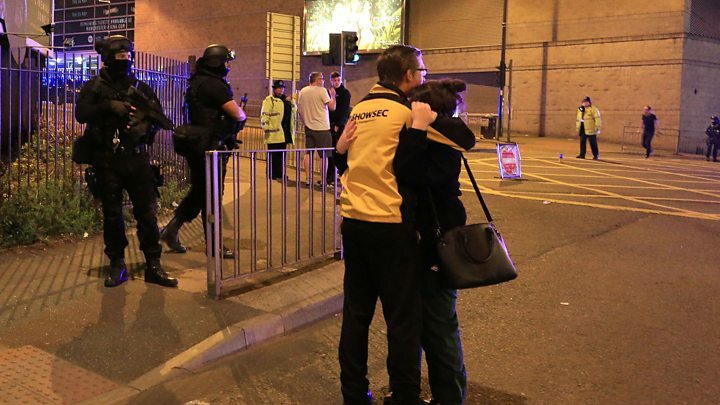 Media captionMum Emma was 15 feet from blast at the Manchester Arena as she collected her children. Rebecca Horrocks, 17, was there with a friend. They were heading to the exit when the explosion went off. "The lights had just come up. We were about to leave through the exit and the explosion shook the floor and there was a bit of smoke coming through the exit. "Everything was silent for a moment then people started screaming and running in the opposite direction and running out of the exit. "We got caught up in the flood of people and left through the next exit. When we got in the foyer there were people's belongings all over the floor, shoes and bags. It was quite foggy. 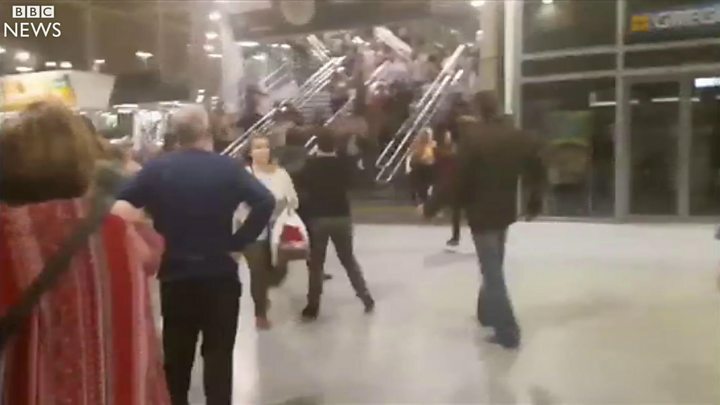 "People were screaming and shouting people's names. We found a little boy and a little girl too, children who had been separated from their guardians and were terrified so we took them across the road and as we waited for their parents, we could hear the emergency services begin to arrive. "We stayed with them for about 15 minutes so they could find their mum. Then we just ran until we met our parents and got home. "We are so lucky to be alive and I'm so sorry I can't say the same for others." Nicky Betteridge was also there with her daughter, Summer. "All of a sudden there was a huge bang and then within seconds people behind me started screaming and running, running past us," she said. "So I grabbed Summer and said 'run' and we started running with everybody else, there were hundreds of people running. "We got to the stairs and everyone was pushing... trying to get down as quickly as we could. "And then we ran outside onto the road and there were lots of people there, crying and shouting." Simon Allsopp and his wife Sarah were driving up the arena to collect their daughter and her friend when they heard the explosion. "I said to my wife 'that was too loud'. We saw kids coming down the steps and I was able to drive to the bottom of the main steps [and] my wife jumped out of the car to find our daughter Charlotte and her friend Gemma. "Kids were running down the steps, crying and screaming, hundreds and hundreds of kids, some running. Parents were stood opposite just in shock. Everyone was confused." Mr Allsopp said it took him seven or eight minutes to drive away from the steps and pull up around the corner. "Taxis were driving towards me beeping their horns, and police were on the scene instantly, right behind me. "I wound my window down to try and hear what had happened. Everyone was on their phones, or crying. A mother and her young daughter came up to my car and knocked on my window. She asked 'have you seen my son?' I said 'I don't know, I don't know where my daughter is'. He said his daughter called to say they had got out of the building and he then saw a "chain" of emergency vehicles coming through. "We were reunited at about 23:15. The girls were crying when we met them. We just wanted to get out of the city and go home." Gary Walker, from Leeds, and his wife were just metres from the explosion, waiting for their daughters to come out. "We heard the last song go and then suddenly there was a massive flash and then a bang and smoke. I felt a pain in my foot and my leg. "She's got a stomach wound and possible a broken leg. College student Sebastian Diaz, 19, from Newcastle, echoed other witnesses' descriptions of mass panic at the end of the concert. "Ariana Grande had just finished her last song and there was a huge bang. I just saw running and it was just instinct to run," he said. "We actually ended up in a corridor and it was a dead end. It was terrifying. "I found the main doors and people were crying everywhere. Back at the hotel people were crying and on their phones."